Are you ready to start talking about what Dahl Landscape can do for your home? Fill out our online questionnaire, and one of our Landscaping Specialists will get back to you to discuss a proposal. Dahl Landscape Company offers a wide range of services, so we are able to handle all aspects of your landscaping project. We have the skill and experience needed to provide beautiful, creative solutions, and to bring your ideas to fruition. Our staff of qualified personnel whose efforts won a Landscape Design Award from the Illinois Landscape Contractors Association are available to you. Dahl Landscape concentrates on design space planning, working directly with you to produce a customized landscape layout that is rich, vigorous and appealing. 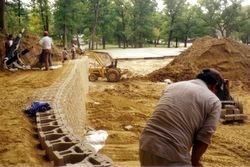 Sculptured Earth Berms, Natural Retaining Walls and Inviting Brick Pedestrian Walks are all elements of Landscape Design we utilize for effective results. Making things work within your budget is not a problem and will be approached with enthusiasm and creativity. Attractive and successful landscape design is our promise to you, satisfaction guaranteed. 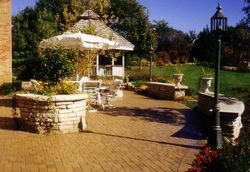 The trademark of Dahl Landscape Company is effective landscape construction. Working together with superintendents, engineers or homeowners, we can organize an installation to meet your deadlines in the most efficient way. Specialized crews trained in installation of Retention Walls, Brick Pavement as well as Grading, are a part of our qualified staff. Our quality control is so effective that we provide a one year warranty on all nursery stock we install. We specialize in brickwork. Whether you're looking for patios, walls, or a specialized structure, we can handle it all. And if you'd like to incorporate some natural stonework as well? That's no problem. 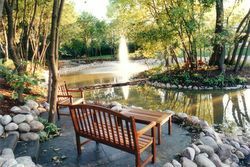 We can create a wide variety of beautiful and unique ponds and waterfalls. One of the largest investments in landscaping is the plant material. How well the plants are cared for, especially during the first two years, is essential to the quality of the plant forever. The beauty of the landscape will be based on the colors used, textures, scents, and how well the over-all plan/effect compliments the house/building. Some of our clients have chosen a lawn care service that only addresses turf (mostly limited to just mowing and edging.) As a result, the plant beds are neglected. Soon the plant material loses form and becomes weakened, allowing for insect and disease infestations to take over. After a while, what remains are a few basic shrubs and/or evergreens and weeds that flourish. In 2009 we initiated our Plant Care Program which addresses all aspects of plant care. Our services include identifying plants, proper pruning timing, and technique, in order to enhance fullness and shape and allow the best possible blooms. Plant dead heading, fertilizing, applying pre-emergent herbicides to beds, insect and fungus control (including systemic applications), weeding, spade edging, and mulching are also included in the maintenance package. Proper maintenance allows for the best overall plant performance, which allows you to enjoy the beauty of your garden. Our staff will help educate you, all the while maintaining your plants and your investment. Landscaping is an investment. Under proper maintenance it will provide you with both beauty and value. Our maintenance division was started in 1989 by popular demand of our customers. We offer a complete Lawn Maintenance and Lawn Care Program. Our services include mowing, fertilizing, cultivating, pruning, weeding and general lawn care. All maintenance is performed by our trained personnel using state of the art equipment.